AKIPRESS.COM - A new exhibition has been unveiled at the Mongolian Dinosaur Museum in Ulaanbaatar on June 27, said News.mn. 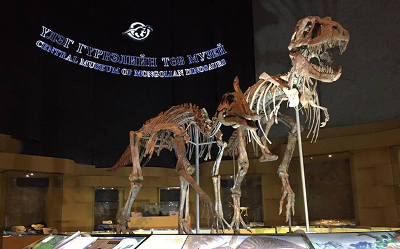 The exhibition displays 3D models of those dinosaurs who used to inhabit Mongolia during the Late Cretaceous (over 66 million years ago). More than 20 fossils, including Tarbosaurus bataar, Saurolophus, Oviraptor and Ankylosaurus, are now on display in the Museum. The exhibition also includes scientifically accurate 3D models and augmented reality technology to bring Mongolia’s prehistoric past alive.